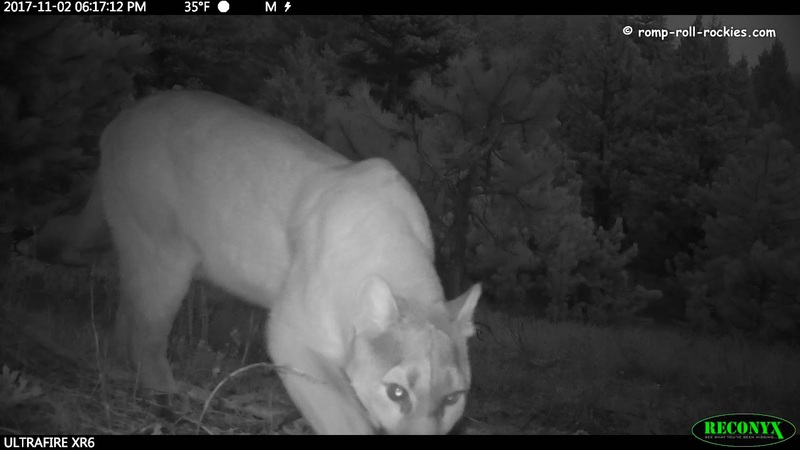 Romping and Rolling in the Rockies: Mountain Lions Everywhere! The start of November has brought a flurry of mountain lion activity. 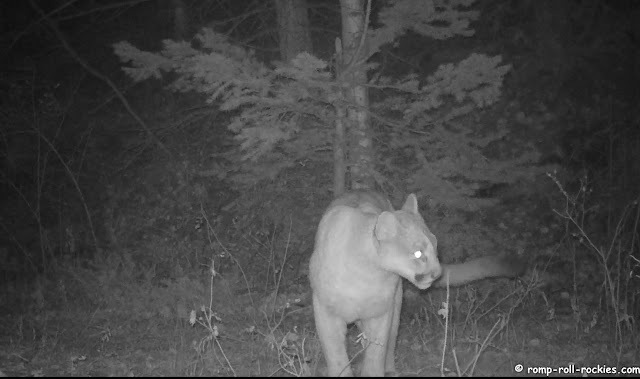 The first one was a very curious lion who sniffed the areas near my trail cams very carefully. Here he was at one cam. Then, he was stopped in his tracks when someone started shooting a gun nearby even though it was fully dark outside. Seriously, why would someone target shoot in the dark? You'll be able to hear it in the video. 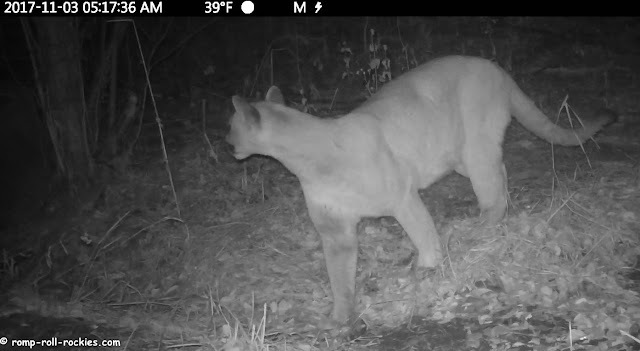 I put together the series of clips into a short video of the travels of our mountain lions over the past couple of days. It's a lot of activity for a short period of time! I glanced over my shoulder more than once while I checked the trail cams today! Despite the chill that goes up my spine each time I see a lion image on a trail cam, I am thrilled to know that our lion population is doing well! I think it is more freighting to think humans are out their shooting in the dark and wonder what they were hunting. so dangerous. the cat is just beautiful. with all this activity do you have a plan if you run up on one while out riding or walking? I've come upon them in the past, and they always run from me. If I'm ever stalked or attacked, I know that I need to be aggressive, trying to run them off or fighting back. They are so amazing. I would think maybe the shooting was a poacher. I hope not though. They really are something to see like that! Down here, shooting in the dark is illegal. A few years ago, in a place where Hugh has camped, a 25 year old teacher was bending down to a tap cleaning her teeth, a man on the back of a ute, caught her headlamp in the spotlight and shot her . he says he thought it was a deer. 2 and half years in jail for manslaughter, he offered her family $10,000, which they gave to charity. The man, and his associates didn't go to help, others in the area assisted her partner, I hope those shooters in your area are VERY careful.Beautiful lions, they look so healthy and thick coats, ready for winter. Fabulous cam footage. For the life of me I cannot fathom your average person shooting any time of day. WOW, they are so beautiful!!!! Love the thought of all that wildlife just goin' about business even when we don't see them. They are so graceful and beautiful! I love seeing photos of these big cats! Apparently we had one in our neighborhood recently! One of my neighbors spotted it out on our lawn! Beautiful animals but would not want to encounter one! Someone illegally hunting, I wonder? They are such beautiful cats....but I sure wouldn't want to meet one out on the trail! OMD, they are so beautifuls! They population here is strong too! I don't know if you saw today, Mark Benioff (a billionaire/philanthropist who lives in Pacific Heights in SF) had one in his backyard! He posted video of it ~ if it's true, wow! right in the City! If it's a true video, that is just crazy. They are such beautiful and curious creatures but I don't think it would be good to meet one face to face. Be careful out there! Drives me absolutely nuts when I hear shots at dusk - surely one of the most dangerous ties for mistaking what you are seeing - or even later. Once I remember at about 10PM. And not a shot or two - which I MIGHT think was someone with a reason to be firing a gun within earshot of houses in the dead of night - but as you say, the sound of target shooting..powpowpowpowpow. What possible reason could there be?